It happens, you make plans for great places to visit and Mother Nature throws you a curve ball. So it was on one of my western excursions. Over the course of a year, through e-mails and phone calls my buddy Jeff and I had made grand plans for a trip into Wyoming. These plans were “thrown to the wind” the day I landed in Salt Lake City. The normally-dry climate had turned into a soppy mess with tons of precipitation imminent. The forecast had a four-state area (Utah, Nevada, Idaho and Wyoming) covered with rain and snow for at least a week, not exactly what we had hoped for. Plan “B” was put into motion. That was to take advantage of “windows” in the bad weather and grab some backcountry time where we could. If it were anywhere else but northern Utah, this may have seemed a poor substitute, but not in this instance, fantastic destinations were mere minutes away. 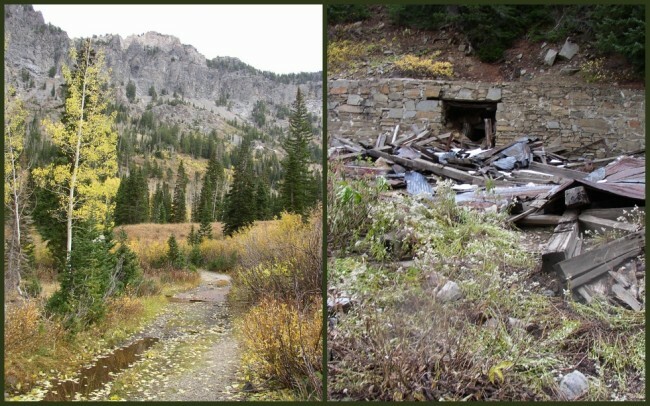 With imposing clouds overhead we decided to “go for it” and head up an old mining road toward an historic site called the Cardiff Fork Mine, located on the south side of the Mill D Fork, west of Reed and Benson ridge. 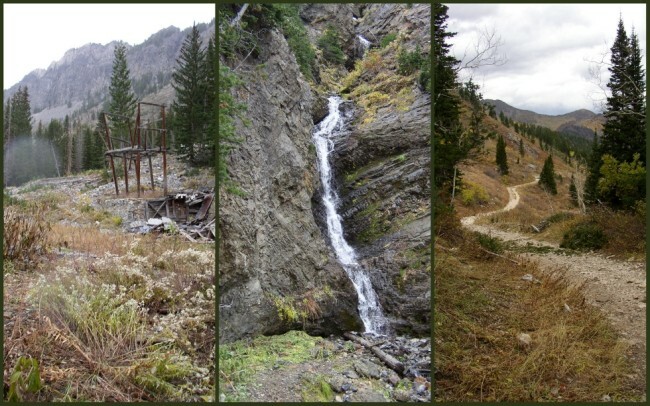 The 2 ½ mile climb (each way), up a steady grade presented a thoroughly enjoyable experience, with beautiful mountain streams and late autumn foliage everywhere. As we trekked up the mountainside, imposing clouds threatened our ascent with the sound of thunder in the distance. As a rule, we would have headed down immediately, but because we were surrounded by forest which offered considerable protection from the elements, we decided to continue onward and upward. The scent of the evergreens was potent as we passed through Aspen, Douglas fir, Engleman spruce and white pines. The geology of this area is complicated as it is riddled with faults and folds galore. Not to mention the interaction of the magma body with the Tintic Quartzite. 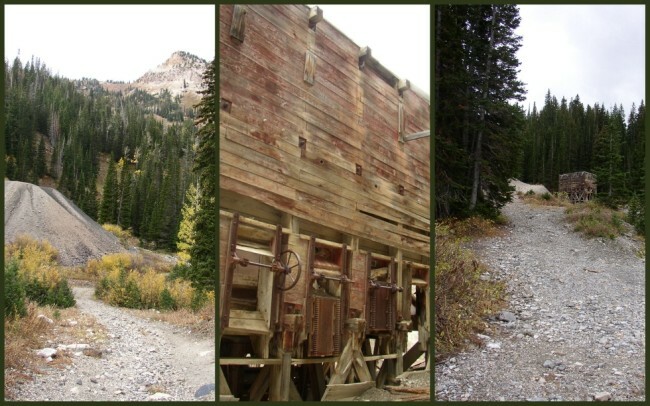 The history of Cardiff Fork Mine (located 9,140 feet above sea level) first began with operations in the 1880’s, but due to a massive avalanche that destroyed the shaft house, mining was terminated in January of 1906. Better times were ahead however when the mine reopened in 1910 with improved financial backing, and a safer (current) location. It remained open until 1967. 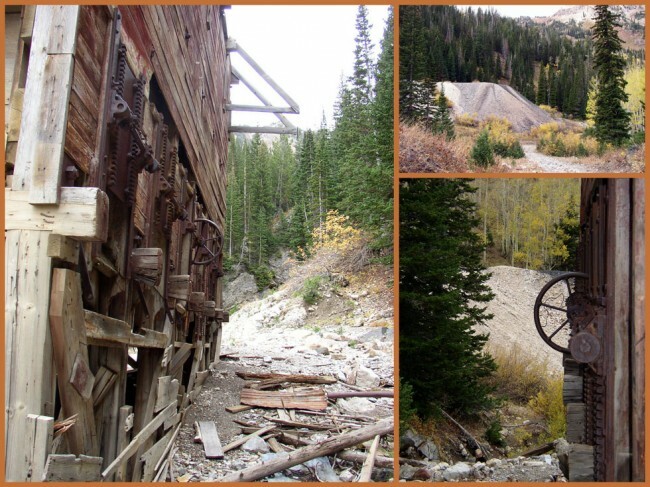 During its heyday (1910 through 1950) the mine produced over 6,600 ounces of gold, and more than 2 million ounces each of silver and copper. 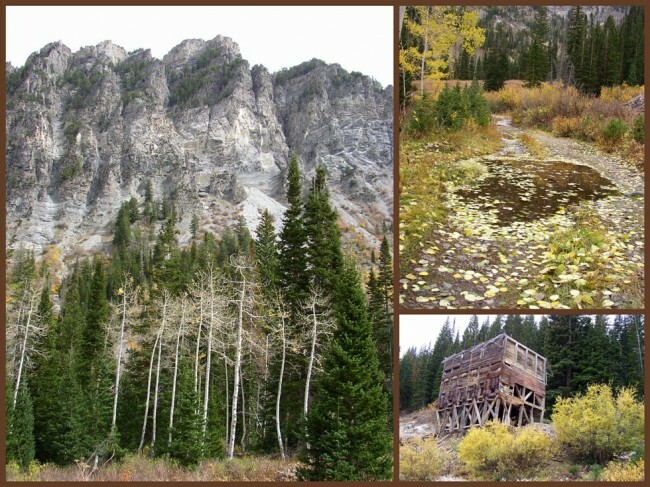 When we entered the clearing where a two-story structure still stands, we were surrounded by piles of tailings (mounds of unwanted post-mining materials) and wooden members, reminiscent of earlier, more-productive days. I was humbled to think about the hardship the miners endured in this remote, raw and demanding environment. Winters on this site would have been “a bear”. Shortly after our arrival to the mine site, the weather finally broke with a loud crash, announcing the arrival of the storm. After a brief exploration of the area, and an even-shorter discussion we decided to head back down the trail to the truck, staying under the canopy of the forest along the trail for protection. This excursion was 100% worth the effort. 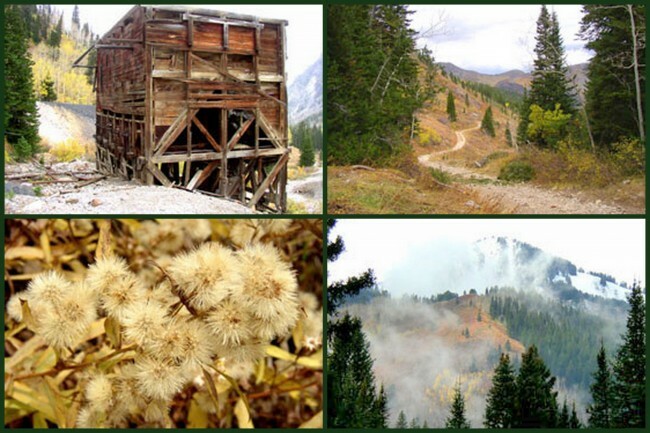 You gain the combined pleasure of a great hike, along with getting to see part of the mining history of the Old West, first-hand. Take time (weather-permitting) to look around the ruins and waterall area before you head back to civilization. There’s a lot more here than “meets the eye”. If you decide to try this hike, you’ll want to get copies of the USGS quad maps for Dromedary Peak and Mount Aire.